The Ellman Tri-Laser machine offers a professional solution for highly effective, yet safe tattoo removal that produces maximum results in just a few treatments. Unlike older methods of tattoo removal, the Ellman Tri-Laser utilizes advanced technology that is designed to deliver maximum power while reducing harm to the surrounding areas of tissue. The system was designed to deliver better results with less pain than traditional laser systems, with an adjustable spot size to make it easy to precisely target treatment areas. Thanks to the industry-leading Tri-Lase Q-switched yag laser technology, this powerful laser from Ellman offers a completely uniform beam technology to eliminate hot spots and ensure consistent energy distribution. This results in less damage to the skin surrounding the treatment area and less swelling and pain during treatment. Highly effective for all tattoo colors, including red, orange, yellow, light green and even deep purple, the Tri-Lase is a smart choice for the most effective tattoo removal and is also ideal for skin resurfacing, wrinkle smooth and micro-laser peels. The Ellman Tri-Lase makes it easy to add powerful multi-functionality to any practice with an easy to use laser system that delivers amazing results. 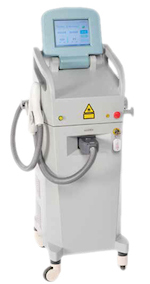 If you want to offer effective tattoo removal and other popular skin services to your customers, the Tri-laser laser machine from Ellman is a smart and innovative choice that is a smart investment for any cosmetic practice. Interested in adding the Ellman Tri-Lase laser system to your tattoo removal practice? SunrayLaser.com has great deals on used Ellman Tri-Lase laser equipment with savings that are up to 60% off the original price! See for yourself how much you can save on high quality used laser equipment when you buy from SunrayLaser.com. Looking for pricing information and other details about our selection of pre-owned Ellman Tri-Lase equipment? Please fill out the form below and we’ll provide a fast and free, no obligation quote. It’s an easy and no-risk way to learn more about this outstanding line of tattoo removal lasers.